We were greeted with smiles when we entered The Fifth Ticket Kitchen + Bar, genuine smiley faces. “That was nice,” I thought. It really was. Yes, I know what you’re thinking. It sounds like Restaurant Management 101; but, when you’re not greeted with a smile it puts things askew, if only temporarily. So, sincere thanks Fifth Ticket for a warm welcome. The room itself is friendly too. It’s large – seating about 60 – but not so large that it lacks personality. It features lots of wood, including bare table tops framed by black leather chairs. A somewhat masculine tone is softened by table candles and the room’s overhead lighting. Fifth Ticket’s ceiling fixtures are striking. They make a statement. I’m not sure what exactly. Maybe … “Take us back to the Science Centre?” Each light fixture looks like a model of a molecule, an organized cluster of 15 or 16 globes, burning bright and white. 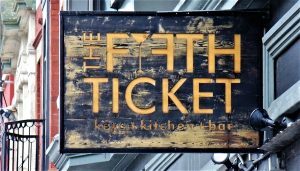 Fifth Ticket’s bar is prominent. 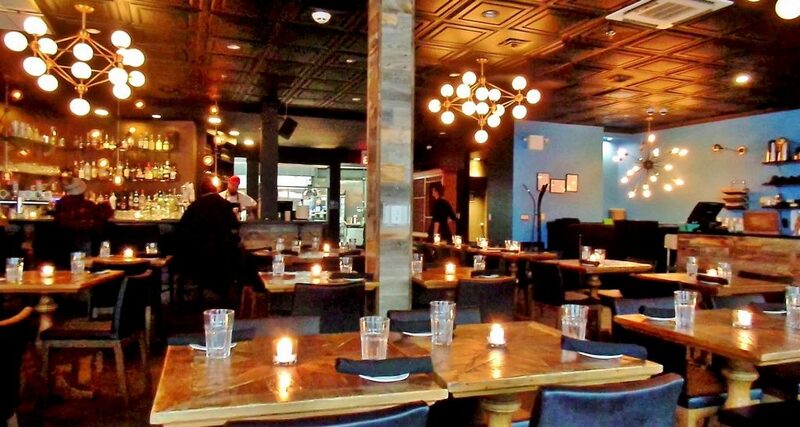 It straddles the north-south border between the restaurant’s semi-open kitchen and the dining area. It casts a warm glow from the well-lit shelves of spirits and polished drinking glasses. 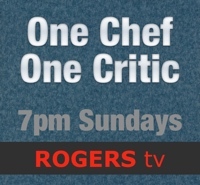 The bar’s placement gives bar staff and kitchen staff equal status, in that you can watch both doing their thing, side by side – but, please, only watch if you’re dining alone or if your companion is glued to a cell phone. Otherwise, you’re much better off having a good chin wag with your dining companions. I’ve been drinking whisky: rye, scotch and bourbon cocktails lately. Next month it may be tequila but, for now, it’s whisky. 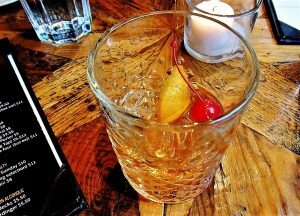 The Scotch Old Fashioned was on my brain since I’d watched an interview with a friend of Charlie Chaplin’s. He said the distinguished film pioneer, actor, director and song writer, loved a Scotch Old Fashioned. Chaplin, from what I’ve read, was a man of taste. If a Scotch Old Fashioned was good enough for him, it’s good enough for me. Since Fifth Ticket’s cocktail list didn’t contain any classic cocktails, and since there are several recipes for the Scotch Old Fashioned, I rattled off my favourite recipe for our server, Jess. It arrived as ordered. Well, there was one discrepancy. I wanted an orange slice. It came with orange peel, but it was still a fine cocktail. Much more bracing than a Manhattan, my default preprandial tipple. Sharing food in restaurants has always seemed natural to me. Isn’t that what side plates are for? I give you a piece of halibut. You give me a lamb chop. 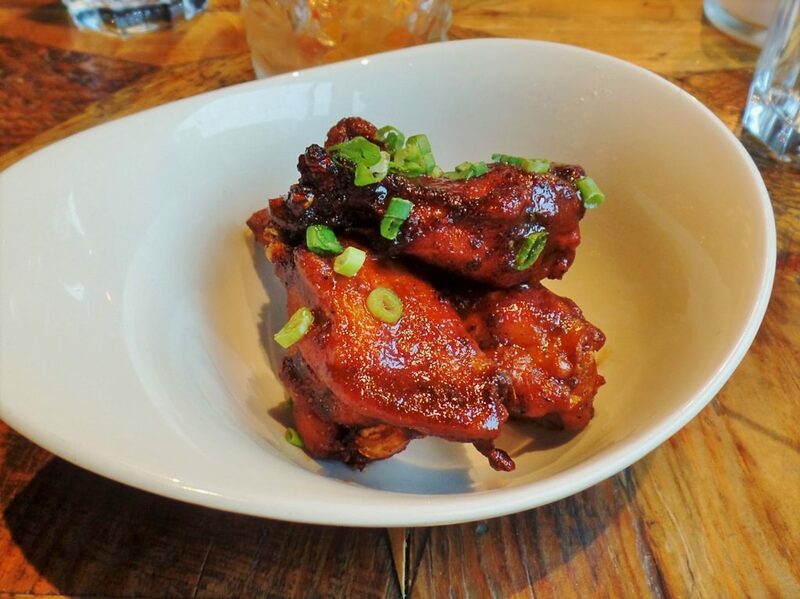 Anyway, these days restaurants are encouraging more of it by offering dishes to be shared, or, as Fifth Ticket calls them, “Shareables.” We shared a bowl of chicken wings. They were smoky and covered in ancho-tamarind sauce. A bit sticky to handle, but worth the inconvenience of having to visit the restroom to wash my hands afterwards. Three dominating tastes – smoke, salt and the slight sour of tamarind – in combination, were seductive. 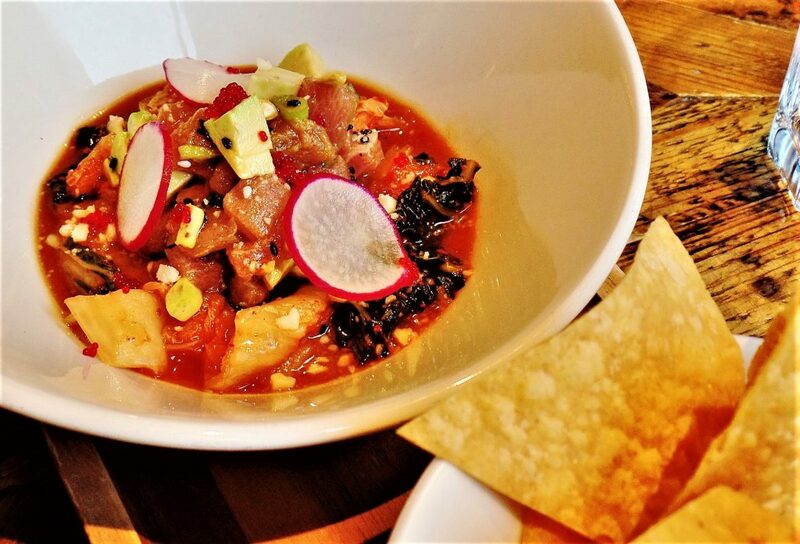 Kimchi tuna poke (pronounced, pooh-kay) is a cold salad of small cubes of raw tuna and house fermented kimchi. A few other things like avocado help with texture. Mainly though, this dish celebrates the wonderfulness of raw fish with soused kimchi. First rate fresh tuna, tang, spice and vegetables scooped up – again and again – on corn chips, until only a stain remains at the bottom of the bowl, equals one outstanding Fifth Ticket appetizer. 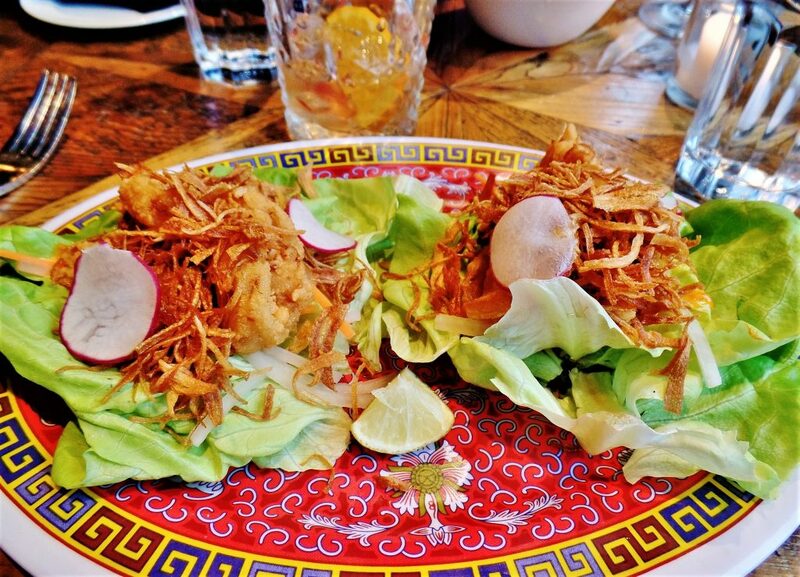 Shrimp lettuce wraps of fried, breaded shrimp on Boston lettuce were laid out open-face on a plate, with pickled vegetables and crispy shallots on the leaves as well. A somewhat humdrum item made significantly more interesting by a dressing of gochujang aioli, named so because it contains a portion of gochujang chili sauce. The sauce is Korean and gives kick and sweetness to the aioli. It was too much of a struggle to roll up the wraps and eat them using our hands, so we resorted to forks and knives. A vegetable korma is a comfort, mainly because of the gently cooked Indian spices and sweet vegetables. 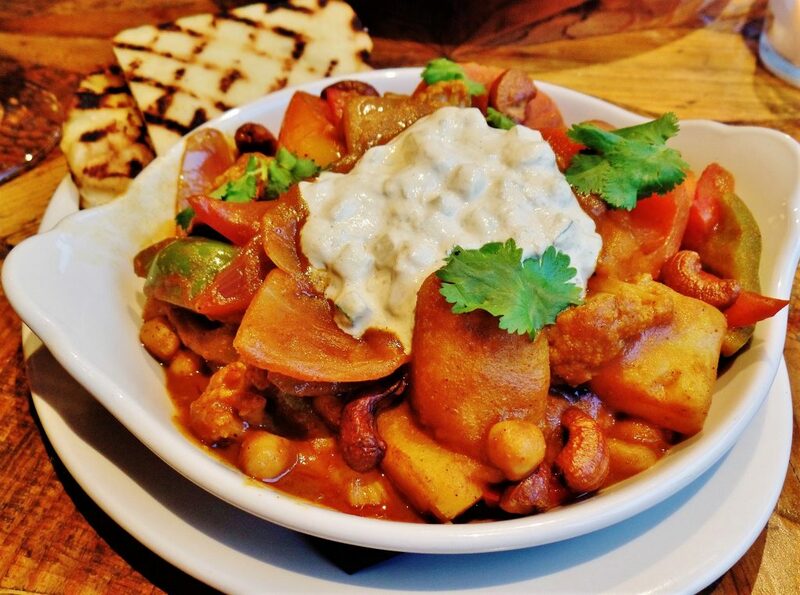 The fragrant stew at Fifth Ticket is made with carrots, sweet peppers, tomatoes, roasted cashews, cauliflower, chickpeas and potatoes. It comes topped with cashew raita – a creamy condiment made from soaked cashews, spices and cucumber – and fresh cilantro. Naan is served on the side. Even though I’m a committed carnivore, I must admit that Fifth Ticket’s korma was one of the evening’s best dishes. Another outstanding dish of the evening, although this time with meat, and plenty of it, was the Sicilian pork ragù. I’ve made Sicilian ragù using ground pork; good, but Fifth Ticket’s was much richer and deep. It was made with confit pork shoulder, slowly cooked and served over house rolled pappardelle – superbly made and cooked – in tomato sauce. Toasted walnuts and grated parmesan finished off the recipe. 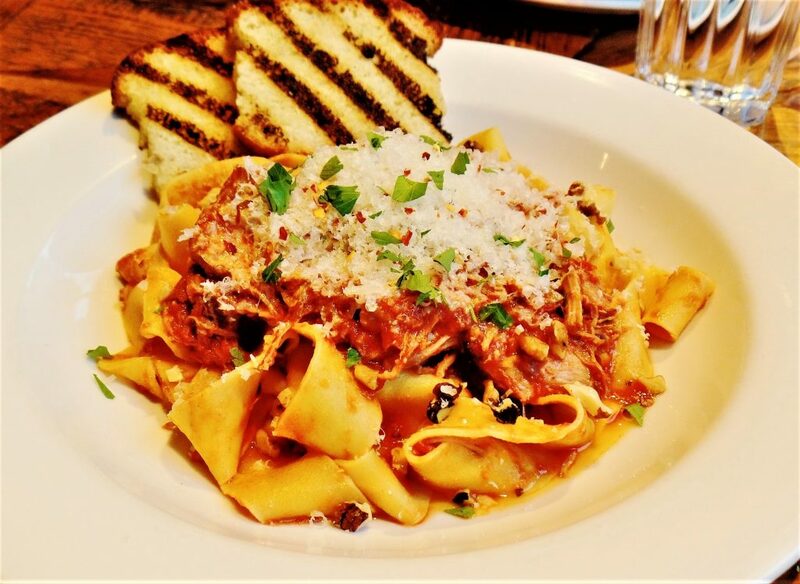 It’s an ideal entrée for the ravenous meat lover. Grilled bread came with it, alas, a little too grilled for my taste. There are 20 or so restaurants downtown. The older ones have lasted for years and years because of consistency – mainly in food and service. The Fifth Ticket is set to be one that lasts. Price Dinner for two with cocktails, wine, tax and tip costs approximately $170. Open Monday to Thursday: 5:30 p.m. to 9 p.m. Friday: 5:30 p.m. to 12 a.m. Saturday: (Lunch) 11 a.m. to 3 p.m. (Dinner) 5:30 p.m. to 12 a.m. Sunday: (Lunch) 11 a.m. to 3 p.m. (Dinner) 5:30 p.m. to 9 p.m.
Reservations Yes and walk-ins are welcome. Beverages Fifth Ticket’s house wines, by glass or bottle, are New World wines – the only exception being Santa Margherita Pinot Grigio from Italy. A glass (5oz) of white or red will cost between $9 and $12. Choices sold by the bottle comprise conventional but agreeable wines from around-the-world. They cost between $38 and $63 – the exception being Tommasi Valpolicella Classico, Corvina Blend, Italy at $97 per bottle. Fifth Ticket’s wine list also includes a small selection of Champagnes, sparkling wines and Ports. Cocktails, about one dozen, include house, and house “seasonal” creations. Imported and domestic beer choices include a rotating selection of local on-tap craft beers. Non-alcoholic cocktails and beers are also available. Best bets Kimchi tuna poke, chicken wings, vegetable korma, Sicilian pork ragù. Gluten free options Yes, and accommodations can be made but please ask server for details. Vegetarian and vegan options Vegetable korma, veggie burger and a few other dishes. Please ask server for details. Wheelchair access Assistance required at entrance, accessible tables and an accessible restroom.